A harassment case and a loss to the only winless team in football can have that effect. DAVIE, Fla. – Miami Dolphins fans are venting on Twitter and complaining on radio about the team owner, the coach, the general manager and even the backup left guard. A harassment case and a loss to a winless team can have that effect. Already staggered by a scandal that has prompted an NFL investigation, the Dolphins must now try to bounce back from their worst loss of the year. Rather than taking out their frustrations of the past two weeks on the hapless Tampa Bay Buccaneers, the Dolphins came out flat Monday night, dug a 15-0 hole and lost 22-19. The loss left the Dolphins at 4-5, with the five defeats coming in the past six games. Fed-up fans took the latest loss hard, and many said owner Stephen Ross should fire everyone, himself included. With the harassment case involving offensive linemen Jonathan Martin and Richie Incognito likely to remain unresolved for at least a couple of weeks, second-year coach Joe Philbin will try to salvage the season beginning Sunday at home against San Diego. Philbin, now 11-14 at Miami, won a vote of confidence before Monday’s game from Ross, but that could change depending on the findings of the NFL’s special investigator. He’ll meet this week with Martin, who is with his family in Los Angeles and receiving counseling for emotional issues. Ross also plans to meet with Martin in California on Wednesday. The second-year pro suddenly left the team two weeks ago, and his attorney has alleged Martin was harassed daily by teammates, including Incognito, who has been suspended. The case inspired a national debate about workplace bullying, attracting a throng of media that has filled the Dolphins’ locker room the past week. The team, however, declined to blame the case on its latest loss. “Yes we faced a lot of distractions, but leading up to this game, the last few days I’ve had a good feeling that the guys were ready to play,” quarterback Ryan Tannehill said. A bigger factor might have been the absence of two starters in a line that was already lousy. 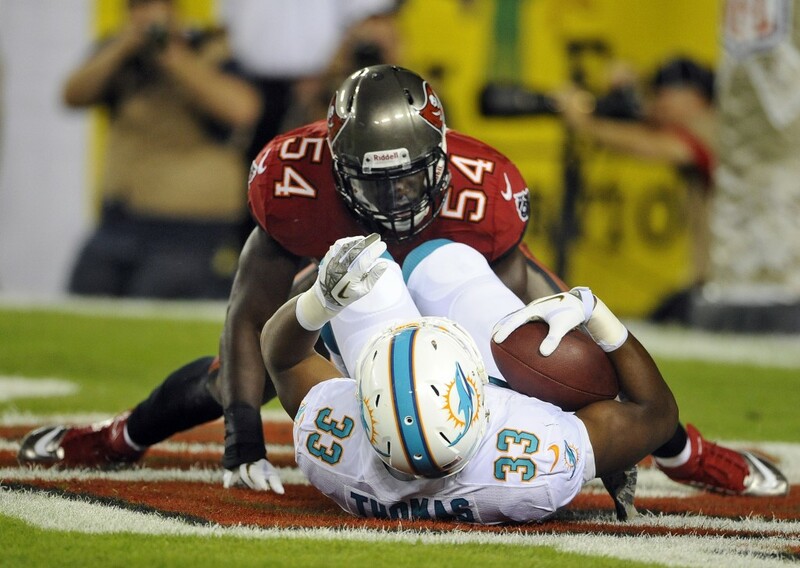 At Tampa, the Dolphins netted a franchise record-low 2 yards in 14 carries. That’s 5.1 inches per carry. At that rate, they would need 71 carries to get a first down. Nate Garner whiffed on several blocks filling in for Incognito at left guard, but no one on the line seemed to get any push downfield. “Not a good job by us,” right tackle Tyson Clabo said. There are plenty of other issues. Run defense is supposedly the team’s strength, but Miami allowed 140 yards on the ground against the injury-riddled Bucs, whose fourth-string running back scored the decisive touchdown. The Dolphins have sunk to 25th in the league in run defense. Tannehill played well but misfired on a long pass to an open Mike Wallace, who was targeted seven times and totaled 15 yards. The $60 million receiver still has only one touchdown this year. First-round pick Dion Jordan was also a nonfactor again at linebacker, playing only nine snaps on defense. While the scoreboard in Tampa argued otherwise, Tannehill said the harassment case unified the team. He predicted the Dolphins will yet bounce back.